Arlee Scarlets Head Coach Bill Stockton talks to his team, a group of players with size and experience working for them. 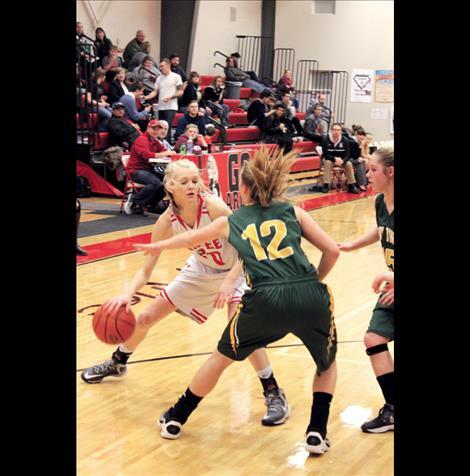 Arlee’s Lady Scarlet Carly Hergett scored nine points in the winning game against St. Regis last Thursday. ARLEE - With a strong senior-led squad, Arlee Scarlets Head Coach Bill Stockton is pleased with the amount of returning experience on this year’s team. The Scarlets won their district championship last season and continued onto divisionals, finishing fourth. Stockton is hoping that this familiarity with each other on the court will help the girls make it further this season come tournament time. With one returning All-State athlete, Becca Whitesell, and three returning All-Conference players: Morgan Malatare, Carly Hergett, and Bryndle Goyins, this team is athletic and is going be a competitive force in their district, according to Stockton. Whitesell and her coach agree that the teamwork also seems natural this year. Whitesell agreed the team is close, on and off the court. “We are more of a family this year,” Whitesell added. Although athleticism, experience, and teamwork are solid components of a winning program, Stockton believes there is still work to be done. 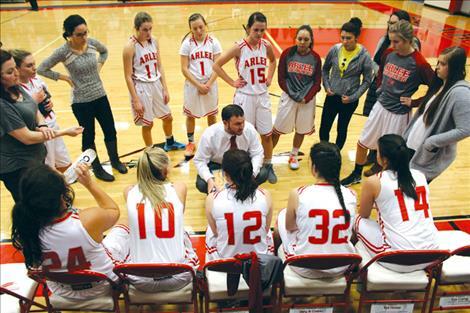 On Thursday, Feb. 28, the Arlee Scarlets added another win onto their current 11-2 record, beating St. Regis 51-23. Leading the team in their win was Ella Lindbergh with 12 points. Other key players were Hergett and Alyssia Vanderburg, each scoring nine points with Ashley Revis adding seven. Whitesell and Revis have two specific goals they are working to accomplish by the end of the 2015-16 basketball season. The second? Make it to State. “I know it is everyone’s goal to make it to State, but we really want to make this year count,” Whitesell added. Stockton is hoping to see the squad’s hard work pay off at the end of the season. The Scarlets travel to Darby Thursday, Feb. 4, for a 7 p.m. tip-off. Following Thursday’s game, Arlee hosts Noxon on Saturday, Feb. 6, for a 4:30 p.m. game. Arlee – Points: Ella Lindbergh 12, Carly Hergett 9, Alyssia Vandenburg 9, Ashley Revis 7, Megan Shick 4, Noelle West 2, Abby Yocum 2, Shaylee Perry 2, Morgan Malatare 2, and Bryndle Goyins 2.